Rogue's real name is unknown to all but her, but she grew up in Lousianna. Her mutant powers of memory and power absobtion brought on by skin contact first manifested when she kissed her childhood friend Cody. The kiss sent him into a coma from which he never recovered. Rogue ran away from home and met Raven Darkholme, better known as Mystique who adopted her and trained her about her powers. Rogue joins the Brotherhood of Evil Mutants with her mother. It's while she was in this organization that Rogue met and absorbed carol Danvers, a.k.a. Ms.Marvel. Rogue's absorbtion of Carol Danvers turned out to be permanent, giving her Carols powers of flight, super strenght, and invulnerability. Rogue had also absorbed carols mind though and on later ocasions she does battle with that part of herself. Rogue leaves the Brotherhood and her mother to join the X-Men during the "From the Ashes" saga. She leaves under some sort of inducement by Masterming, the mutant illusionist. She goes to the X-Men so she can learn to control her powers and is not at first accepted by the other X-Men even though Xavier insists that they give her a chance. Rogue proves her worth when she later saves Mariko, Wolverines love, in the same saga. Even though her going to the team may have not been entierly her descision, she stayed with them making it the best dscision of her life. Rogue stays with the team through the many changes including when the team moved base to Australia and has always been an important member. Later on, Rogue meets the cajun X-Man Gambit and an attraction forms between them. Rogue falls is love with the charming thief but always feels torn at not being able to touch him and sometimes pushes him away. But before the AoA, when they think they are all going to die, Gambit and Rogue share a kiss in Isreal. That kiss sends Gambit into a coma and leaves Rogue with Gambit's dark secret in the back of her mind(the world didn't end of course!). That secret sends Rogue fleeing across country with her fellow teamate Iceman. Rogue didn't know what she absorbed but she knew the pain it caused the man she loved. Gambit awoke from his coma and chased after her. When they met, she asked to know his secret that was in her head. Gambit couldn't tell her so the separated with Rogue leaving the X-Men for a while. 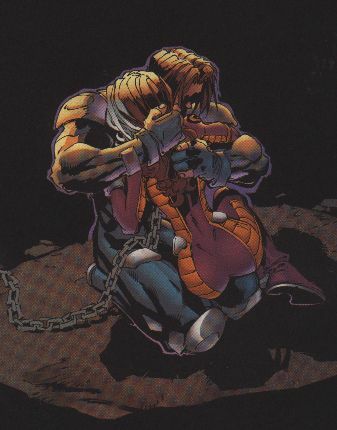 They met again during the Onslaught story line and events led to the tortured lovers coming together in Uncanny#348. But in #350 Gambit is placed on trial by Eric the Red(later shown to be Magneto). Rogue is forced to absorb Gambit again so she can know and tell his secret, that he got the Mauraders together for Sinister and led them to the Morlock tunnels. Rogue is horrified that the man she loved could ever do such a thing and is torn by that. She leaves Gambit in Antartica to fend for himself, a descision Storm said that was probably as much his as hers(due to the absorbtion and Gambit's guilt). Rogue returned to what was left of teir home with the X-Men and continues to be tortured by her descision and her absorbtion powers. The problems Gambit's phyche have given her make her obsessed with touching people and she might has already touched Wolverine. We don't know for sure and she's now so upset she is going to the Agee Institute where doctor Agee says he has cured his sister of being a mutant. She gave him a DNA sample, and began to regret it when she did when she spotted him leaving some goverment agency. He explained and seemingly convinced her that he was only refusing an offer to join said agency because he only cared about helping mutants like he did for his sister. But we now know what his sister is really like. A grey mass of flesh and eyes sustained alive in a tank. The doctor plans the same horrible fate for Rogue convinced that he is doing the right thing in making mutants not-mutant anymore(can't exactly say they are normal after his process though). Well now it turns out we were wrong about Doc. Agee. He fixed the process so no one else would end up like his sister. Rogue was going to be cured, but Mystique who was there secretly observing as the senators with with a few other goverment oficials, pulled Rogue out and convinced her to deal with being a mutant instead of trying to change it(that wasn't her exact resoning, but those were the effects). Rogue decided to also destroy the machine so no mutant would be forced to change against their will. In Uncanny #361 we learn that Rogue has been making secret trips to Antartica to look for any trace of Gambit. She's upset that she hasn't found anything yet, because she still loves him and feels torn with the guilt of leaving him.